In a time when clean energy becomes more and more important and marine regulations become stricter and stricter, harbours and onshore facilities need to find affordable economic solutions to supply ships and facilities with low emission energy. 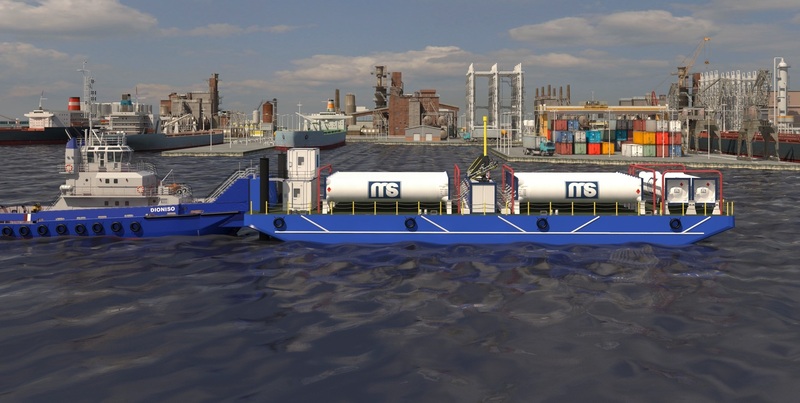 Resulting from this scenario Marine Service has developed the worldwide unique LNG barge – equipped with Marine Service’s LNG Fuel Tank Containers (or Type C tanks), gas handling and service containers – all 40 feet ISO types. The customized barge is able to provide services to port stations and moored or anchored ships at any time. The barge itself is to be towed and provides a pusher bar at the stern for a pusher tug. There are self-propelled versions of the barge available as well. Marine Service developed an easy to use custody transfer system, using a weighing cell system for the LNG tank containers, which allows easy training of operators on site. For more detailed information please watch our animated short film and download our brochure.